The flag of Israel adopted in 1948 features a blue Star of David on a white background bordered with a blue horizontal stripe each above and below the star. The flag design is reminiscent of the Jewish prayer shawl, which is white with black or blue stripes. 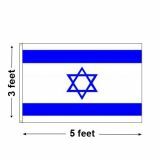 100% made in the USA, our Israeli Flags are made of 200 Denier nylon with UV resistant Dupont ink imprints. Finished with durable poly sateen header and brass grommets, these flags are well suited for both indoor and outdoor use.We also have exclusive indoor and parade flags that come with a gold fringed design, which makes great adornments at prayer halls and homes. Shop right away and get the advantage of the best prices, quick shipping and much more! 100% customer satisfaction guaranteed! 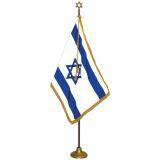 Show your religious pride with these Israeli flags that make perfect symbols of beauty and finesse. Made of superior quality nylon fabric, our flags feature the Star of David, a six-pointed star or hexagram, which is the universal symbol of the Jewish religion. Finished with durable heading and brass grommets our flags are designed to last long and look great and will make perfect additions for homes and synagogues. Flying an Israel Flag is the best way to show your religious identity! Browse our collection of and shop for these beautifully crafted flags. Need help? Feel free to call us at our toll free number (888) 287-3524 or email at customercare@tuffflags.com and we shall assist you.